Fresh Coat of Paint: Craigslist Score! I've already written here and here about our experiences with Craigslist. When we first moved into the condo, Corey was still in school and most of my savings were directed towards the down payment and necessary renos. This left us with an entire 1000 square feet (give or take) of space to furnish on a pretty strict budget. Instead of settling on generic Ikea (not that I have any problem with Ikea) furnishings, we made a game of finding unique pieces for our space. Not only did this strategy end up costing us less, it gave us a chance to express ourselves and save some quality items from the landfill. We decided to incorporate a vintage theme to give ourselves a place to start. Armed with only a very basic knowledge of iconic styles and designers, we decided to forget about trying to find anything with a pedigree and just focus on items with cool lines or interesting character. Now, I don't pretend that this didn't take some perseverance. For a month before we moved and a couple of weeks after, I probably checked Craigslist twice daily. 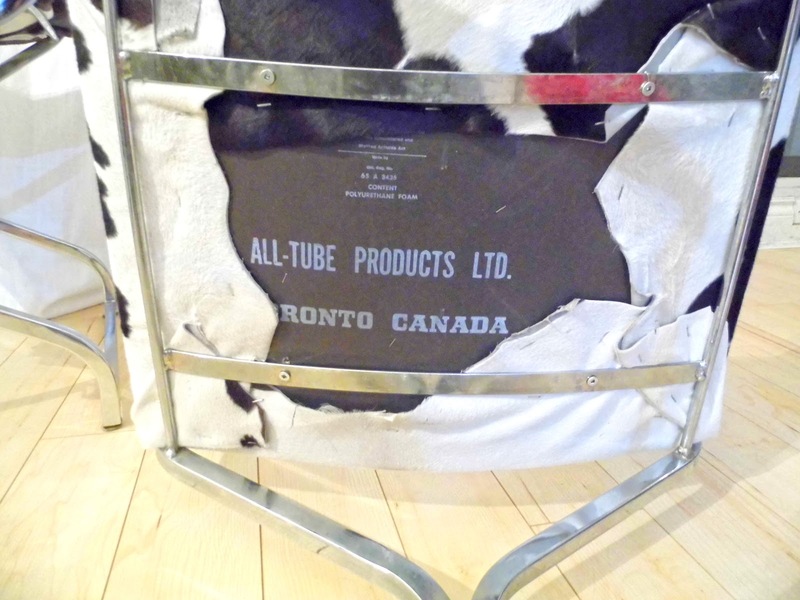 I searched words like "chrome" "vintage" "retro" and "eames," hoping it would yield some cool results but mostly finding either junk or fabulous designer furniture which was priced accordingly. Eventually, we started to turn up some worthwhile results and (due to my Craigslist "Spidey Sense" and commitment to being the first to pounce on a good quality, reasonably priced listing) we built our home one item at a time. We met some interesting characters along the way and we're still pretty sure they people who sold us the lamp bases that now live in our bedroom were trying to get us to join a religious cult... Not kidding. But we can now look back on it as an adventure. 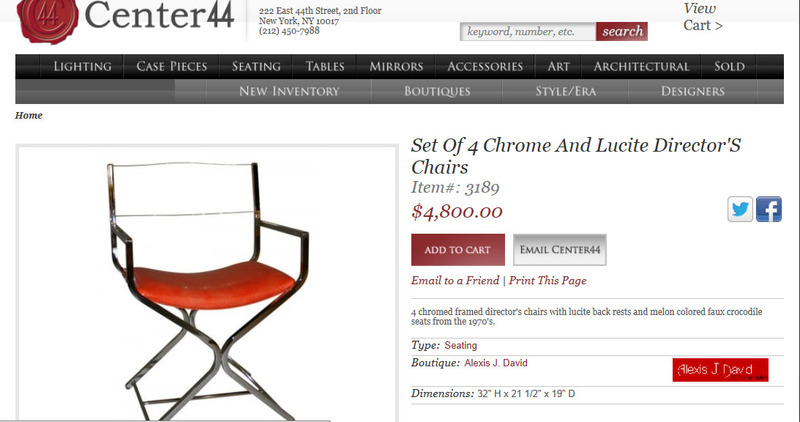 One day, we found a pair of director's chairs with a chrome base being sold in Ajax. They were clearly 70's vintage and they looked just like the chair pictured in the top photo, only the back was smoked lucite (which actually matched our funky smoked glass dining room light fixture) and the seat was an ugly light brown suede. The price tag was $100 for both so we arranged to pop by after work that day. We purchased some cowhide scraps since we weren't going to use it for a rug. 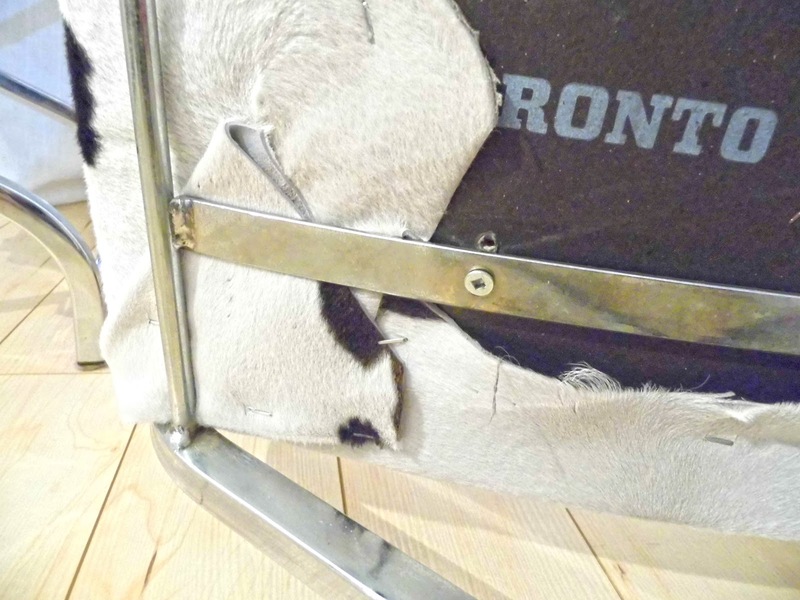 Sometimes you can also buy an imperfect hide (with a scar or brand mark) to use for upholstering. This will save you some money. We flipped them over and unscrewed the seats. We traced them onto the cowhide scraps we were using. Trace generously (leave at least six inches on each side) since you can always trim more later. Use a staple gun to secure it. We left the corners until the end so we could use both hands to fold it neatly. Cowhide is thick so be patient. Note- this is an old DIY so forgive me for just flipping the chairs for the photographs and not taking them apart again. Once you're finished stapling and the corners are fairly smooth, you can trim the edges. Don't worry about your mistakes showing- We are definitely NOT perfectionists and nobody has ever noticed. Check out the close-up of our messy work, below. Be generous with your staples. And voila! 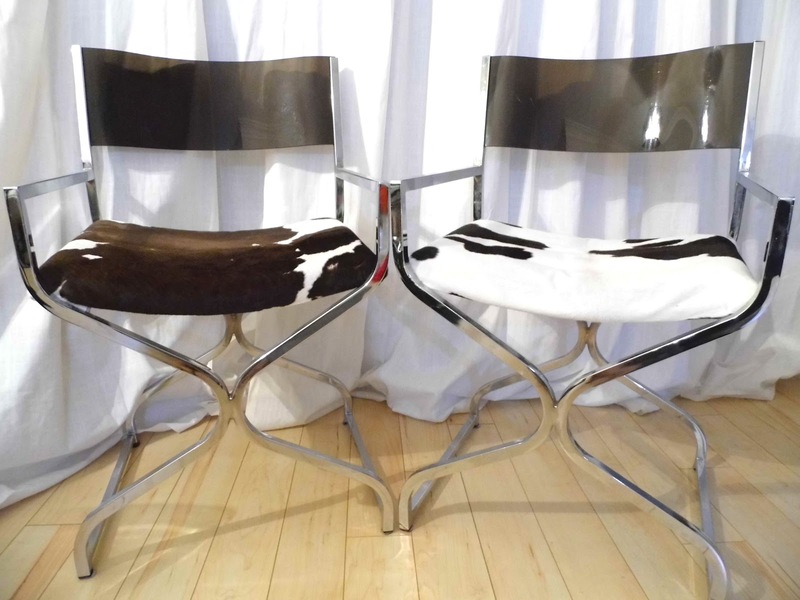 We have two funky cowhide chairs that are charmingly (we think) mismatched. But that's not the end of the story, although I promise to get to the point soon. Update: This wasn't a one-time deal! Check out another of our "Craigslist Scores" here. WitchList: Top 5 Craigslist Finds! Where did you purchase the cowhide scraps? Love these! 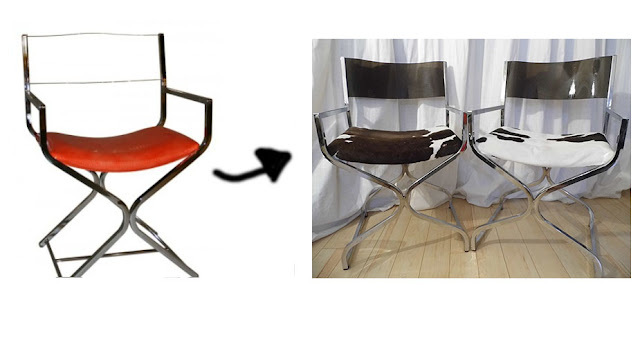 Great find and fantastic re-upholstery job!